Congratulations! 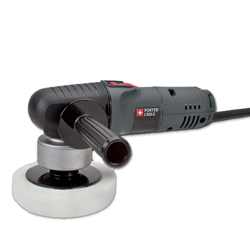 You now own the Porter Cable 7424 XP Car Polisher, which is the polisher of choice among car enthusiasts and professionals! Using the Porter Cable 7424 XP Car Polisher is the safe and easy way to achieve, protect and maintain that sought after deep, wet looking show car shine! Working by hand just can�t produce the brilliant shine you can achieve by machine but many are afraid to take the step up as they fear the machine will do more harm than good. Set your mind at ease! There are no worries when it comes to the Porter Cable 7424 XP Car Polisher damaging your paint, even if you have never used a car polisher before! This machine offers variable speeds and a random orbit dual action for safe, swirl free polishing. The Porter Cable 7424 XP Car Polisher with the correct pad and polish, is capable of removing random isolated scratches, swirl, oxidation, water spots, acid rain etching and bird dropping damage as well as other unfortunate paint defects that stand in the way of that brilliant shine. The Porter Cable 7424 XP Car Polisher is also a great maintenance tool for your gloss enhancement polishing, pre-wax cleaning and applying thin, even coats of your favorite car wax, paint sealant or protectant. Even if you have never used any type of car polisher you can still achieve an amazing, swirl free shine. This guide will take you through the process step-by-step. It's easy to give out advice on what steps to take to make your car look good, but there are many variables that come into play that we need to consider. This guide will lead you through the necessary steps to achieve that sought after, deep, wet looking shine. Now let�s get started! You know how you want it to look but you must also take in to consideration the time involved, tools needed and if the damage is severe, your own skill level. Here are a few things you need to think about before you start your surface evaluation process. Now that we know what we have to work with, let�s evaluate the surface of your paint to determine our plan of attack. Is your paint new or like new, in need of light polishing for gloss enhancement, requiring minor defect removal or is your paint neglected and needing heavy defect removal? This is difficult to tell until you start polishing your car. Some paints are harder than others making defect removal more difficult so more aggressive products would be needed. This is difficult to tell unless you have a paint thickness gage. Without a gage, what you need to look for is thin spots or any areas that may have been burnt through in the past by inexperienced detailers with the wrong type of buffer. If you find a thin area, stay away from that area with your polisher. You can't polish out thin paint, it just wears it away. Now that we know what needs to be corrected we need to choose the proper polish and polishing pad to correct the defects in your paint�s surface and achieve desired results. Now that you have evaluated the surface and know what needs to be done it�s time to figure out what products you will need to get the job done. Keep in mind you always start with your least aggressive product for the job and step up in aggressiveness only if needed. The Lake Country yellow cutting pad or orange light cutting pad is the first step in serious defect removal such as random isolated scratches, heavy swirl, severe oxidation, stubborn water etching and other difficult to remove paint defects. Use either the yellow or orange for safe and efficient removal of more serious defects with Pinnacle Advanced Swirl Remover or Pinnacle Advanced Compound. The white polishing pad or orange light cutting pad is the second step for minor defect removal of swirl, fine isolated scratches, water spots, mild water etching, light oxidation and other less severe paint finish defects. Use the either the white or orange pad for safe and competent removal of medium to light common defects with the Pinnacle Advanced Finishing Polish, BLACKFIRE SRC Finishing Polish, 3D AAT Finishing Polish or your choice of swirl removal type product. The white polishing or green polishing/finishing pad is your third step in paint perfection and is used to clean your paint and enhance gloss so you can achieve that desired deep, wet looking shine. Use the either the white or green pad for your pre-wax cleaning and final gloss enhancement as well as to prep your surface for proper bonding of car wax, paint sealant or protectant with the Pinnacle Paintwork Cleansing Lotion, Wolfgang Paintwork Polish Enhancer or your selection of fine polish or pre-wax cleaner. The black/grey finishing pad or blue finessing pad is the final step to a flawless finish and is used to safely apply your car wax, paint sealant or protectant. Use the either the gray or blue pad for thin, even application of the Pinnacle Liquid Souveran Wax or the car wax, paint sealant or protectant of your choice. Remember to never work in direct sunlight or on a hot surface. Good lighting is also very important so you are able to evaluate your work during the polishing process. Thoroughly wash and dry your car. Use a detailing clay to remove bonded surface contamination that is in the way of polishing your paint. Choose and about a 2' by 2' area on the surface to begin your process. Usually the worst area is your best choice. With painter�s tape, tape off any sharp edges and trim to avoid staining trim, build up in cracks and crevices and pad damage. Select the proper polish and polishing pad based on your surface evaluation to start your process. Adjust your speed setting according to the �Recommended Speed Setting Guide� below. Place the pad on the surface of the paint. Turn on the power switch. WARNING! Never lift the polisher off the surface of your paint while it is turned on! 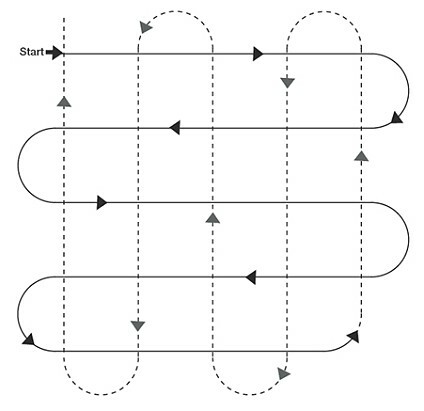 When removing any type of defects apply medium pressure while polishing and move in SLOW overlapping motions according to the �Recommended Paint Polishing Pattern Guide� below. When the polish is worked in well it will start to turn clear. At this point turn off the machine and lift it off the surface of the paint. With a clean, quality microfiber towel, buff the remaining product residue off the surface of your paint. In good lighting, evaluate your work. If it looks like you need to work on the defects a little more, add a few more pea size dabs of polish and repeat your process until your evaluation revels success. (Keep in mind when using more aggressive products you need to work your way down in aggressiveness to achieve your best shine.) Don�t forget, this is a four-step process but you may not need all for steps. Working in sections that are no larger than 2� by 2� to concentrate your work repeat the necessary polishing processes over the entire surface of your car until desired results are achieved. Remember areas with more serious defects will require more polishing time so be patient and allow the polisher to do it's job. Using your final wax pad, apply your favorite car wax, paint sealant or paint protectant and allow to cure. Remove remaining residue with a clean, quality microfiber towel or buff off using your microfiber bonnets to reveal a brilliant shine! Maintain your shine by quick detailing when lightly dusty and regular washing as needed with a quality car wash shampoo, wash mitt and microfiber drying towel. Proper machine polishing is as easy as following this simple pattern and concentrating your work in a 2' by 2' section at a time. Master this and you are on your way to a brilliant shine! Note: Not all paint finishes require the entire four-step process. Complete only the steps necessary for the condition or your paint finish.